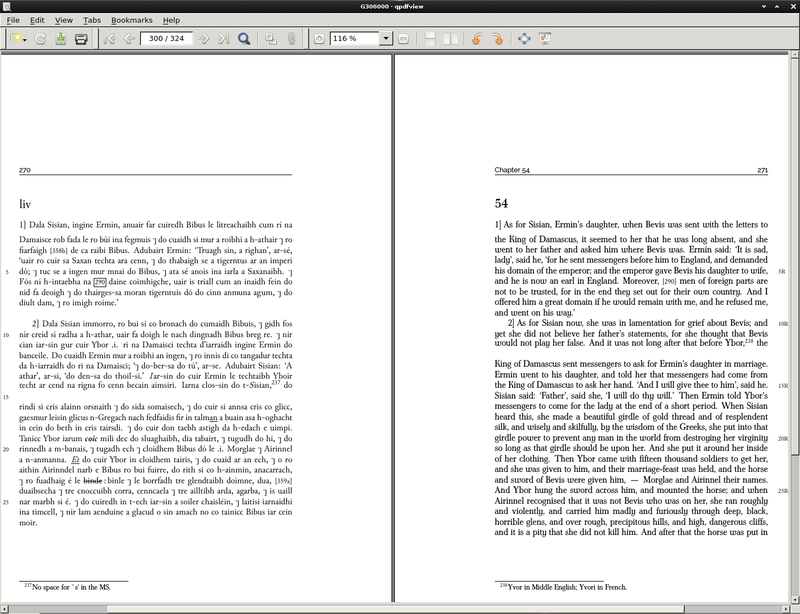 I am formatting a facing-page translation using reledmac/reledpar and I am seeing occasional (apparently random) extra blank lines in mid-paragraph where there is no break in the source text. You can see this in the example at line 15 on the left-hand page and between 12R and 13R on the right-hand page. (edit) This is the output of \showputput around the word "Ybor" towards the end of line 12R on the right-hand side. There is also a problem in that there is an extra blank line after the first line of every section (on both sides), although this looks like less than one \baselineskip. Before I start stripping everything back to the bare metal for an MWE, has anyone seen this before, or got pointers to where I might start looking? Fixed. The setspace package, which I had been using to compensate for the Junicode typeface having a much smaller set than Antykwa Torunska, was somehow interfering in the footnote mechanism. Remove the package reference and annul the spacing changes, and the bogus lines go away. I have not found out what it is in setspace.sty that causes this, but it may be a silent conflict in internal macros. Not the answer you're looking for? Browse other questions tagged line-spacing reledmac setspace reledpar or ask your own question.